Lock in a great price for Centara Grand Beach Resort & Villas Krabi – rated 8.3 by recent guests! The resort was absolutely beyond expectations. The room, restaurants, pool and service were extraordinary. My jaw dropped when we pulled up upon the resort (by boat only). The pool was huge, and even when kids were around, you could find your own space. The resort is only accessible by boat or a rickety "monkey trail." The monkey trail isn't for everyone though. There is a regular boat shuttle that runs back and forth from the resort to town every half hour. The monkey trail is about a 15-20 minute hike on a boardwalk-style trail up over the cliff/jetty that secludes Centara from the town of Ao Nang. You can hitch a long tail boat from the beach of Ao Nang to the surrounding islands. Or, you can schedule one from the activities desk to pick you up from Centara's floating pier. Great location. Great buffet. Options for food. No real need to leave the resort/beach. Free kayaking for resort customers. Great drinks. The exclusive location and an array of activities . The staff is really nice and quite attentive. We got a free upgrade to a jacuzzi in the balcony room. Everything was amazing, the hotel at self was at great location. Staff was very kind and helpful. We got early check in, as we ask for it upon booking. They have a good deal for a club member, where u have a nice refreshments and alcohol during the day . Very clean, will recommend to everyone. Breakfast was excellent! Choice for every taste! Great stay, just know you need to go to the pier to get on a boat that runs every hour to get there and back. Place is great, takes debit/credit cards and everyone is very nice. The best place i stayed in Thailand!!! Location was fabulous. I loved the privacy of both beach and rooms. Outdoor area of rooms were excellent. Centara Grand Beach Resort & Villas Krabi This rating is a reflection of how the property compares to the industry standard when it comes to price, facilities and services available. It's based on a self-evaluation by the property. Use this rating to help choose your stay! Located on the private Pai Plong Bay, Centara Grand Beach houses beachfront dining options, 2 outdoor pools and a spa. Its rooms offer a private balcony with garden or ocean views. 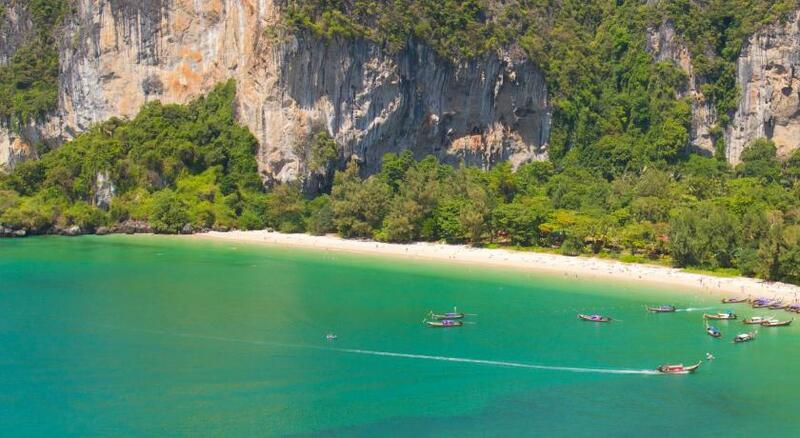 Centara Grand Beach Resort & Villas Krabi provides a free speedboat shuttle to Nopparatthara Beach. Krabi International Airport is a 40-minute drive away. Airport transfers can be arranged at an additional charge. Rooms at Grand Centara are decorated with modern Thai furnishings. Equipped with a lounge area, each room also comes with cable TV, a safe and a mini-bar. Some rooms offer an outdoor spa bath. The Dove and Watersport Center offers activities like sailing and windsurfing. Guests can exercise at the fitness center or purchase souvenirs at the gift shop. Centara Grand Resort also has a kid’s club and a tour desk. Buffet breakfast is served at Lotus Court Restaurant, which also features regular live music. Sea views accompany Thai and seafood meals at the open-air Rim Saai Restaurant. Refreshments, afternoon snacks and a dinner menu are available at On The Rocks Beach Bar and Grill. When would you like to stay at Centara Grand Beach Resort & Villas Krabi? Facing the sea, room features a private balcony. Includes air conditioning, a cable TV and a private bathroom with a bathtub. This room features a spacious layout. Spacious room features a private outdoor whirlpool bathtub and SPA Cenvaree bath amenities. Featuring a private balcony with garden views. Includes air conditioning, a cable TV and a private bathroom with a bathtub. This luxurious room offers views of the grounds. This air-conditioned, 1-bedroom, villa has uninterrupted ocean views. Featuring a separate bedroom, the villa features a living area, a dining area and a fully-furnished private terrace complete with a 161 ft² pool. There is a luxurious bathroom that comes with both a bathtub and a rain shower. 2 flat-screen TVs have international, satellite TV channels and there is a personal DVD player with in-house movies. Other room amenities include a workspace desk, minibar and a safe. Guests have access to the Club Lounge and benefits are included. This air-conditioned, 2-bedroom, beachfront-facing villa is located close to the beach and provides a stunning view of the sunset. Each spacious villa comes with a generous living area, a dining area and a furnished terrace overlooking the beach. There are 2 luxurious bathrooms that come with both a bathtub and a rain shower. 3 flat-screen TVs have international satellite TV channels and there is a personal DVD player with in-house movies. Other room amenities include a workspace desk, minibar and a safe. Guests have access to the Club Lounge and benefits are included. This twin/double room has a balcony, mini-bar and seating area. This double room has a balcony, air conditioning and executive lounge access. This double room features a balcony, air conditioning and executive lounge access. Laid-back and naturally beautiful, Krabi offers some of Thailand’s most striking scenery, where verdant interiors meet turquoise waters, and where nature trails and limestone islands form natural attractions abound. House Rules Centara Grand Beach Resort & Villas Krabi takes special requests – add in the next step! Centara Grand Beach Resort &amp; Villas Krabi accepts these cards and reserves the right to temporarily hold an amount prior to arrival. Centara Grand Beach Resort & Villas Krabi accepts these cards and reserves the right to temporarily hold an amount prior to arrival. Please note that the resort is located on a private beach and can only be reached using the resort's own transportation. They provide complimentary speedboat transfers between Haad Nopparatthara Pier and the resort to ensure the most convenient and safest transfer for guests. - Nopparatthara Pier to resort: 07:30, 08:30, 09:30, 10:30, 11:30, 12:30, 13:30, 14:30, 15:30, 16:30, 17:30, 18:30, 19:30, 20:30, 21:30, 22:30, 23:30 and 00:30. The shuttle boat service is subject to first come, first served basis. Please arrive at least 15-minute before departure time. The boat services operate subject to health and safety controls, especially related to local weather conditions, and are subject to change, reduction or addition without prior notice. Private boat transfers via longtail boat or speedboat are available at an additional charge. To make transfer arrangements, guests are requested to contact the resort directly using the contact details found on the booking confirmation. Nothing major, just a few things that you wouldn't expect to find in a 5 star hotel: the bath stopper was broken and had to call in a mechanic to fix it. The toilet paper was not folded and clearly started and used before. Small stuff really, but you don't expect these things at this price range. The resort is absolutely magnificent. It's in a secluded beach that you can only get to by boat or by walking the "Monkey Trail" through the national park (it's pretty steep though, you won't be able to take luggage on the trail). We got the seaview room with a jacuzzi and I'm glad we did, the view was magnificent and cooling off in the jacuzzi during the evening was great. The staff were friendly and helpful and of the 6-8 staff we interacted with, all but one spoke great English. They were all professional and friendly. They offered a complimentary shuttle to my next location (another hotel in Ao Nang) which we greatly appreciated. Honestly, there isn't anything that I would really change about the resort. It was wonderful! If I HAD to nit pick something... Here's a few things: - Bar opens at 10:30am for drinks at the pool. Definitely wanted drinks earlier than that on a couple of days! - We had an early excursion and had to meet up at 7am in town. Breakfast opened at 6:30. Room service wasn't an option before 6:30 either. - Limited chairs around the big pool. Other chairs away from the pool were mostly in shaded areas. As a sun worshipper (and a late riser), I would have appreciated more sun drenched lounges - The boat shuttle wasn't quite the flexibility that I was hoping for. But worked out just fine. It is recommended that you schedule it in advance to ensure there's room for you. - The beach was not quite as large as I was expecting. It was very wide, but the run from the sidewalk to the water was pretty short. The beach at low tide though is pretty incredible. - Drink / Food service at the pool loungers could have been quicker / more attentive. Despite these points, our stay was amazing! Men at work with bulldozer during beach time in the afternoon was noisy, but we need them to make the resort beautiful ! The mix of beach + forest was just wondered, with a wonderful feeling to share the island with the nature 👍 room concept with jacuzzi and sea view was just amazing !! Location was a bit isolated, but that is what we were looking for. Private Beach and wonderful facilities in the hotel. Water bottles in the restaurants are way too expensive. We got a free upgrade to a better room, which had amazing view and facilities. The hotel is very clean and located just beside a national park, so we got to see some monkeys and other wild life in the area of the hotel. The restaurants serve good food, a bit more expensive than the average Thai food you can by, but still reasonable price. As people have mentioned previously, the rooms are a little tired but when you're located on the side of a mountain, only possible to get to by boat and a rickety mountain walk way, you can understand that renovation comes at a high price. The rooms were still lovely and clean in every aspect though. We had a couple of problems with a sink leaking but the maintenance quickly came and sorted it without problem. This hotel is something very special. Built into the side of a mountain, you have steep cliff face behind you as you look out to the ocean over your own private beach. The restaurants on site are western prices but good value for money portion wise and delicious. Doesn't look like a 5 stars in terms of in room deco style, and finition but a good 4 stars. Would need to be resfreshed a little and more luxurious than they are. - i booked a sea view room and didn't get any view on the sea at all. We changed the room the 2nd night with a wonderful sea view, problem was a big antenna just above our head. Before I stayed in different hotel (4*) for half price than this one and the other one offered better services, even nicer, modern room and they offer a lot of complimentary things. The daily essentials like drinking water, which you can get in nearby town is regular price 0,70 €/1,5 L or 1,50€/5 L , but in the hotel it costs approx. 2€/0,5L (cheapest) or 5,5€/1 L Evian. Thats very very expansive and terrible business on guests (because every single day the boats comes to the resort many times per day so they can supply hotel with plenty of drinking water anytime), who pay already a lot of money for staying there. You are charged extra almost for everything. The staff was wonderful, smiley, polite and very helpful. Local Thai staff was great, very caring and sweet, resort overall is quite good, however what really ruined one of my breakfasts at the property is the angry and arrogant attitude of the head chef from breakfast area (either French or German nationality), who was just refusing to pack food for my 1 year old, as it apparently violates the rules of the hotel, was very disappointed with that. Location was beautiful, however the beach is not as it seems on the picture, we were visiting during low tide season, and beach water was full of leaves and seaweed, so could not swim properly. SPA was great, must go for Thai traditional massage. The staff weren’t particularly polite, mostly due to the fact that they were fully booked during a peak holiday season. Some staff were not friendly in assisting queries. Additionally, the resort was very crowded and hence the swimming pool was packed and there weren’t enough sun chairs to go around. The location and facilities were great, especially with an almost exclusive beach. Plenty of activities to occupy a group, including a free hour of canoe rental.